A sofa can make or break your impression. Don't take a chance with your home's aesthetic appeal and get this 2-seater sofa Baffin from Nilkamal. The chocolate colored sofa looks great in homes and even in offices. Use them in your living room, play room, TV room or even in your lounge. Whether your home has contemporary interiors or traditional, the color and design of this sofa will fit seamlessly in your home or office. The product is made of kiln dried hardwood frame, making it resilient and highly durable. The seat cushion of made of foam and S-spring with webbing that provides adequate support without and excellent durability too. The back cushion also comes with S-spring and webbing along with fiber fill for a comfortable experience. The luxurious looks of the sofa come with unmatched relaxation and enviable opulence. The upholstery of the sofa is made of top grain Italian semi airline leather and artificial leather. It looks good, provides a muted sheen and lasts very long too. The wide armrest of the sofa makes it even more comfortable. Rest on the sofa while you enjoy watching TV or spending quality time with your family or friends.Bring a sophisticated furniture item your @home for extra comfort, durability and classy style. A sofa can make or break your impression. Don’t take a chance with your home’s aesthetic appeal and get this 2-seater sofa Baffin from Nilkamal. The chocolate colored sofa looks great in homes and even in offices. Use them in your living room, play room, TV room or even in your lounge. Whether your home has contemporary interiors or traditional, the color and design of this sofa will fit seamlessly in your home or office. The product is made of kiln dried hardwood frame, making it resilient and highly durable. The seat cushion of made of foam and S-spring with webbing that provides adequate support without and excellent durability too. The back cushion also comes with S-spring and webbing along with fiber fill for a comfortable experience. The luxurious looks of the sofa come with unmatched relaxation and enviable opulence. 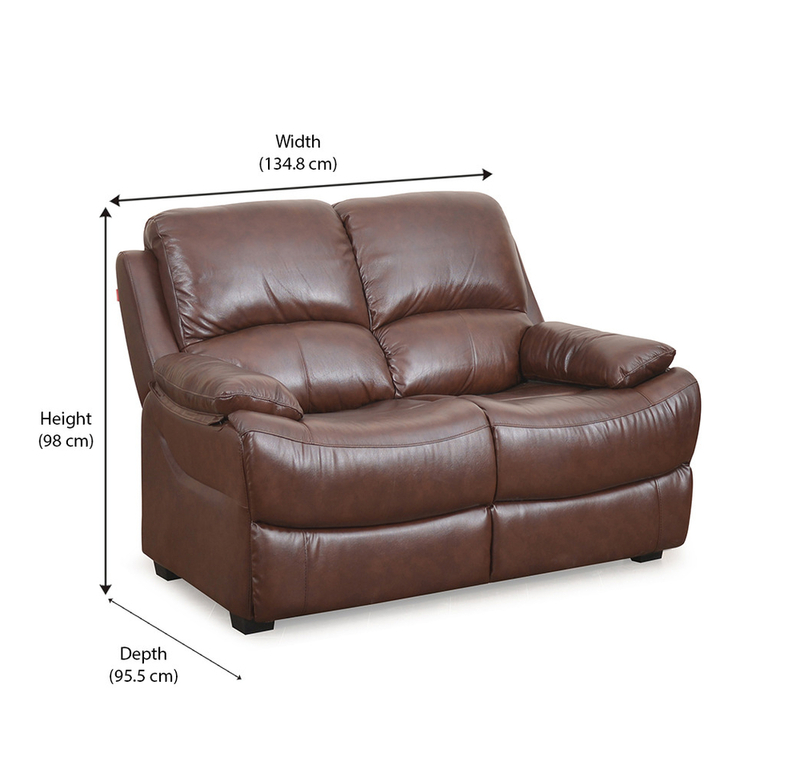 The upholstery of the sofa is made of top grain Italian semi airline leather and artificial leather. It looks good, provides a muted sheen and lasts very long too. The wide armrest of the sofa makes it even more comfortable. Rest on the sofa while you enjoy watching TV or spending quality time with your family or friends.Bring a sophisticated furniture item your @home for extra comfort, durability and classy style.